Frustrated by existing outdated software ? Looking for cost-efficient and user-friendly alternative ? Has volume of your business data and transactions outgrown your manual systems ? Looking for more control over your business ? Looking for business growth & expansion ? StudentLogic is a multi-branch, cost-efficient, and user-friendly school management system designed for enrichment centres, tuition centres and pre-schools. It automates all processes from registration through sales, attendance tracking, fees management to reports generation. NextLogic's top priority are customers and their business needs. We live and breathe customers. The output of our work is always dependent on the relationship we develop with our client and delivery of promises made. However, it is a both ways responsibility. Our customers are our partners and we are also very demanding of them when it comes to time spent on working with us on automating the business processes successfully. 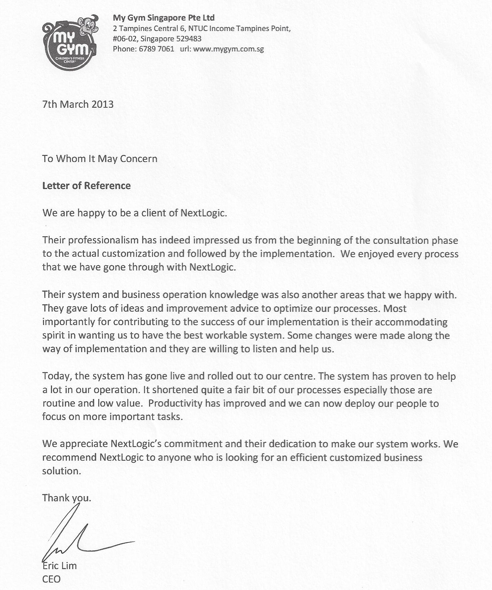 "We appreciate NextLogic for what they have done for us. They have managed to build a system that is useful and has helped us tremendously to save our processing time and our cost. We have increased productivity, eliminated mistakes and enhanced control over our operations and expenses, which was a challenge before. "The software done was excellent and exceeded our initial expectations. 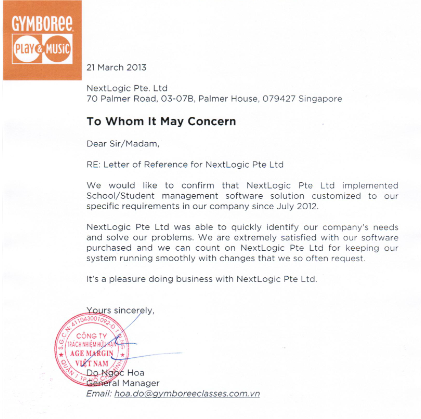 We appreciate NextLogic's professionalism and willingness to go extra mile for client. We will continue to work with NextLogic to further develop our software. I highly recommend NextLogic with absolute confidence." "We are fully satisfied with NextLogic's work. They always deliver what we wish for. NextLogic has been out partner for years and now we know it was a great choice." "Project 180 (Youth Services) enjoyed a good working relationship with Nextlogic. Dasha and Peter's experiences working with Voluntary Welfare Organizations meant that they understood the requirements as well as contraints in our project. They went the extra mile in helping us when complications arise. We are also very appreciate with Nextlogic's generosity in the implementation of value-added functions during the process." July 2012: NextLogic has officially launched StudentLogic Pro 3.0.8 - a multi-branch, cost-efficient and user-friendly integrated web based school management system that automates all business processes from registration through sales, attendance tracking, fees management to reports generation. For more details see StudentLogic website. November 2010: NextLogic has been appointed to develop a customized Volunteers Portal for Mendaki Yayasan, Singapore. September 2010: NextLogic has been appointed to develop a customized Volunteers Management System for Mendaki Yayasan, Singapore. June 2010: NextLogic has been appointed to develop a customized management software for Singapore-based training company Grace Management & Consultancy Services Pte Ltd.
May 2010: NextLogic has been appointed to develop a customized Events Management System for Academy of Medicine, Singapore. May 2010: NextLogic has been appointed to develop a customized Wealth Portfolio Management System for Taurus Wealth Advisors Pte Ltd Singapore. NextLogic has secured 50% funding for this project from IDA Singapore through Technical Innovation Grant. March 2010: NextLogic has been appointed to customize and implement NextLogic ERP Platform in Benlux Pte Ltd, Singapore. February 2010: IDA Singapore launches new grants for Singapore SMEs to support their business operations automation and increase in productivity and efficiency. NextLogic assists local SMEs in obtaining grants for customized IT software solutions. For more information, please visit IDA's website. January 2010: NextLogic has been appointed to develop a customized e-CRM/ERP Platform for Teleo Pte Ltd with assistance of IDA's TIP (Technical Innovation Program) grant. Copyright © NextLogic Pte. Ltd., 2010. All Rights Reserved.